If the urban legends are true, Luke Perry auditioned nearly 300 times before landing the role of brooding millionaire son, Dylan McKay on Fox’s teen drama, ‘s Beverly Hills, 90210. Never really leaving the public eye and always a delicious spoonful of eye candy, Perry has recently found new audience appeal on The CW’s newest high school drama, Riverdale, an updated TV adaptation of Archie Comics. Through it all, he has remained grounded, gracious, and adept. His wicked sense of humor leaves all who meet him loving him not just for his iconic past, but also for his slightly “dark and twisted” future as a celebrity who is as tenacious as he is compassionate. In a recent interview, Perry shared his latest projects, passions, and everything in between. Joshua Estrin: The East Coast is seeing signs of spring. Spending so much time in Hollywood, do you miss the change of seasons? Luke Perry: I know the change of seasons gets a great deal of mileage, but I love the “endless summer” so I will let other people miss the seasons for me. JE: Recently you were in New York City for a very special cause. While there did you frequent any favorite “hot spots”? LP: I really like spending time at Perla in the West Village. It has a great menu, great staff and a no bullsh*t approach to a meal. 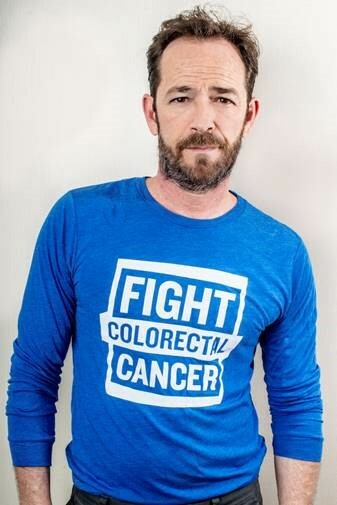 JE: While some may want to write you off as just another handsome Hollywood face, you have some very strong convictions, and one of those is regarding colorectal cancer. Tell me about your latest project. L.P.: I am involved because the wife of my best childhood friend was diagnosed with stage III colorectal cancer , and without getting all soft on you, I promised my buddy and his family I would do anything to help raise awareness of screening and the cancer. So I do what I can as a volunteer ambassador with Fight Colorectal Cancer. I may make a lot of jokes, but this is very serious and important to me. So much so, I had a colon cancer screening and the doctor found pre-cancerous polyps which had to be removed. J.E. : In general, cancer was once a topic people only whispered about. While we are far more open about it now, it is still something not everyone is comfortable discussing. Why is it so important to keep the dialogue going? L.P. I am not always the guy with the politically correct answer so let me cut to the chase. People die from cancer. People we love die from cancer and cancer is something we need to talk about. Everyone has a connection to cancer, so we need to cut the bullsh*t and do what we need to do to stay healthy and keep the one’s we love alive. We don’t have the luxury of being uncomfortable when it comes to getting the facts, and part of that means talking about things that may not seem polite. Look, no one wakes up and thinks. “Hey today is the day I am going to talk to my buddies about a colonoscopy.” But maybe we should, maybe we should worry less about being embarrassed and more about staying cancer free. With a face that still makes many weak in the knees and a new hit series, Perry continues to greet the world with a wry sense of humor as he supports friends, family, and fans as an ambassador of health and a man on a mission to raise awareness and help find a cure for colorectal cancer.